"Employee financial wellness directly impacts the bottom line of your business." 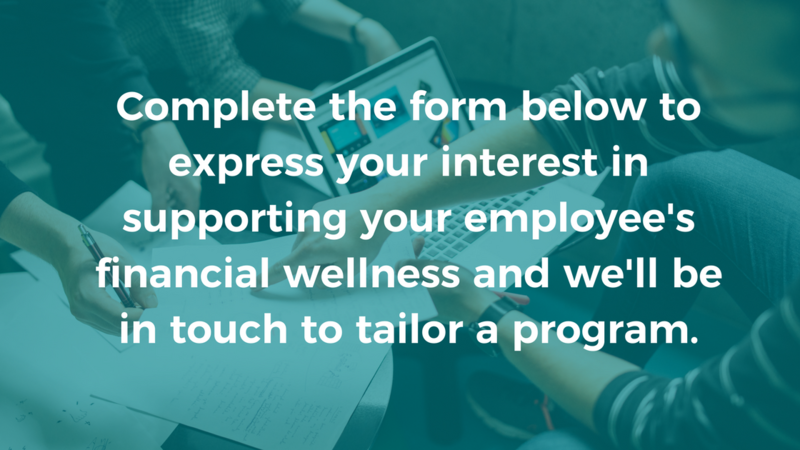 Nexus Money will improve your employee financial wellness through personalised education and expert advice so that you can both feel confident about your financial future. Financially stressed employees are less satisfied with their lives, less engaged with their employers and more likely to underperform at work. Financial stress can cause both physical and psychological health issues such as anxiety and depression. This doesn’t just decrease employee productivity and increase sick days, it can have a toxic impact on your team culture and cost you thousands of dollars in lost revenue. A lack of knowledge about financial products is the leading reason your employees could find themselves in a financial situation they don’t understand and can’t get out of on their own. This prevents your employees from reaching their personal and financial goals which over time has been shown to cause feelings of hopelessness and distress. Leading companies are building financial education into their employee benefits program to address the increasing level of financial stress and it’s impacts. This has been shown to decrease personal financial stress and enhance wellbeing, leading to healthier, happier and more productive staff. Our corporate financial wellness program leads to more committed employees. We work with business owners to offer free and confidential financial reviews for their staff to reduce financial stress, increase knowledge and promote a more positive and educated financial mindset. Usually, there is little to no cost to the business owner and with less financial stress and more confidence comes a happier and more productive workplace. Want to learn more? Register your interest below and our team will be in touch to share more about what we do and how it can positively benefit your employee outcomes.